NOAA’s Consolidated Backup (CBU) Facility better known as the Robert H. Mollohan Research Facility in Fairmont. Believe it or not, those 16.4-meter satellite arrays have been quietly collecting data and images from sophisticated weather satellites circling the earth. “The average person on the street has no idea just how important this program is to our country and world, but it is a big deal,” High Tech Foundation President and CEO Jim Estep said. The “big deal” Estep mentioned got even bigger last Nov. 19 when NASA and the National Oceanic and Atmospheric Administration launched the most modern weather satellite ever developed. NOAA calls it the Geostationary Operational Environmental Satellite-R Series (GOES-R), or the next generation of geostationary weather satellites. There are four satellites in the series: GOES-R, GOES-S, GOES-T and GOES-U. The GOES-R Series Program is a collaborative development and acquisition effort between the NOAA and NASA to develop, launch and operate the satellites. On that chilly Saturday evening, the world’s most advanced weather satellite ever built successfully launched from Space Launch Complex 41 at Cape Canaveral Air Force Station, Florida, aboard an Atlas V 541 rocket. GOES-R became GOES-16 when it reached a geostationary orbit 22,300 miles above the Earth. GOES-16 will provide images of weather patterns and severe storms as frequently as every 30 seconds, according to the GOES-R mission description website. These images will provide National Weather Service forecasters the meteorological equivalent of going from black and white to Ultra-HD color TV, according to a NASA press release. The new satellite can deliver vivid images of severe weather by scanning the Earth five times faster, with four times greater image resolution and using triple the number of spectral channels compared with older weather spacecraft. “The technology deployed on the GOES-16 satellite and the capabilities of its supporting infrastructure will propel our understanding of weather and climate so far ahead, it is hard to describe it,” Estep said. “This program is likely the most important non-defense department satellite program in the country. The larger relationship between NOAA and the I-79 Tech Park began in 2010 when officials announced a $27.6 million American Reinvestment and Recovery Act investment to build a state-of-the-art supercomputer center at the Robert H. Mollohan Facility. At the time, former NOAA Administrator Jane Lubchenco was joined with former U.S. Rep. Alan B. Mollohan for a ribbon-cutting ceremony for the NOAA Environmental Security Computing Center, (NESCC), which is geared to develop and improve the accuracy of global and regional climate and weather model predictions. Estep was there as well. Seven years later, the 54,000-square foot facility has evolved to handle several critical functions of national interest. Estep is not only the primary caretaker of the I-79 High Tech Park, but has been an outspoken advocate for the work NOAA is doing in Fairmont. The success of the NESCC, Estep explained, established the foundation for NOAA to award to the contract for the GOES-R satellite ground station project in 2012. Leslie agreed, adding that NOAA has been building up the Fairmont site to increase its ability to ingest a diverse array of weather-related information from multiple sources in the sky. As a backup site, its biggest test came in November 2014. NOAA experienced multiple outages which created limited access to or affected the accuracy of crucial weather data to the public and America’s weather industry. In a statement, the National Weather Service said at the time that its primary broadcast uplink site lost commercial power and backup power from around 9:30-10:28 a.m. EST Nov. 6, 2014. The satellite broadcast network came back online when it switched to the backup master ground station in Fairmont. “The primary function of the GOES-R CBU is to support contingency operations and perform all of the critical functions of NOAA’s Satellite Operations Facility (NSOF) in Suitland, Maryland, and Wallops Command and Data Acquisition Station in Wallops, Virginia, through the production and distribution of life and property products,” Leslie explained. The Fairmont facility will continue to play a major role during the testing procedures and beyond. “The back-up facility is extremely important to the seamless operation of NOAA’s weather satellites, which provide life-saving weather forecasts,” Leslie said. “Through the facility’s presence, NOAA is looking forward to being part of the Fairmont community for many years to come. Leslie went on to explain how the long-standing, positive relationship between NOAA and Fairmont has grown and strengthened since the ribbon cutting in 2010. 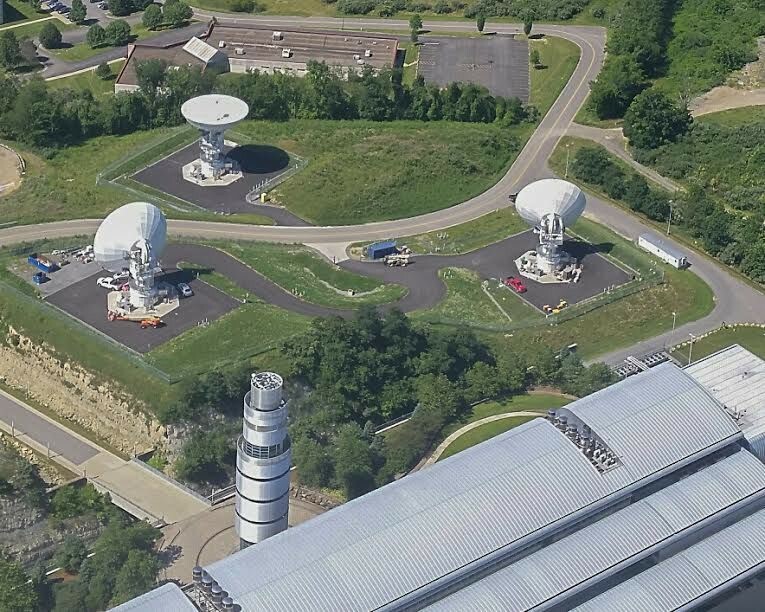 For Estep, however, the successful relationship between NOAA and the I-79 High Technology Park goes beyond Fairmont and even North Central West Virginia.